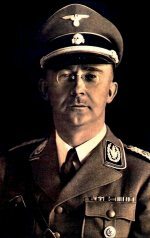 Heinrich Himmler was born in München (Munich) on 7 October 1900, as second son of the pious authoritarian Roman Catholic schoolmaster Gebhard Himmler. Educated at secondary school in Landshut, Himmler served as an officer cadet in the 11th Bavarian Regiment at the end of WW1, although he saw no active service. After working briefly as a salesman for a fertilizer manufacturing firm, Himmler joined the Nazi party and in November 1923 participated in the Beer-Hall Putsch as a standard bearer at the side of Ernst Röhm. On the re-formation of the party, his diligence and loyalty were rewarded when he was appointed head of Hitler’s personal bodyguard in January 1929. The black-shirted Schutzstaffel, better known as the SS, was at that time a small body of 200 men. 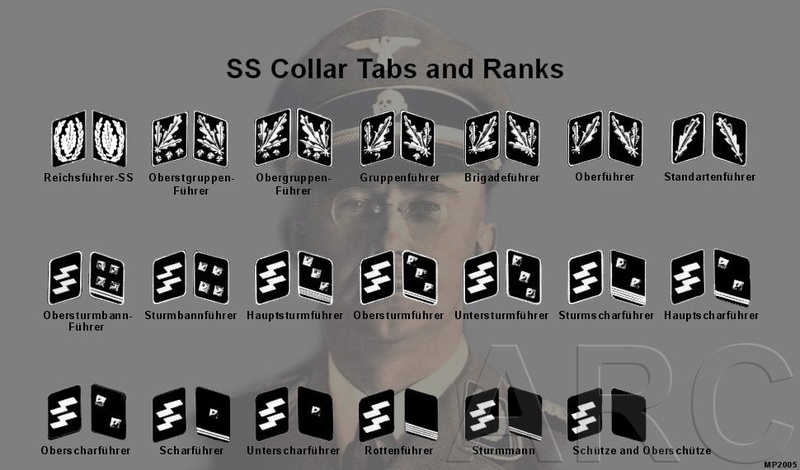 Under his leadership this small force grew to become an all-embracing empire within the Nazi "Third Reich" (SS ranks). 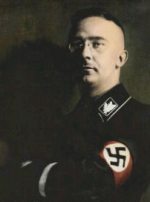 Himmler supplemented his modest salary by running a small holding near München with his wife Marga, whom he had married in 1927, and who shared both his interest in country life and his fetish for herbal medicines. Marga bore him a daughter, Gudrun, in 1929. Himmler was essentially a desk worker with a pedantic head for detail. He compensated for his own physical deficiencies through his obsession with racial purity and the athletic prowess of his men. As early as 1931 he instituted a marriage code for the SS that forbade any man to take a bride who could not prove the purity of her Aryan blood for a couple of centuries. He created SS bride schools and also established Lebensborn maternity institutions, where young girls selected for their pure Nordic traits could procreate with SS-men. Their offspring were better cared for than in normal maternity homes. Himmler’s acquisition of power was achieved by subtle and devious means. After being appointed Commander of the political police throughout Bavaria, he was appointed head of the Prussian Police and Gestapo on 20 April 1934. The turning-point in Himmler’s career was his masterminding of the purge of the SA, on 29/30 June 1934, which eliminated the power of the SA and paved the way for the emergence of the SS as an independent, all powerful organisation. He was ably supported by Reinhard Heydrich who headed the intelligence service of the party, the Sicherheitsdienst, better known as the SD. Heydrich had the stomach for the more ruthless aspects of Nazi racial policy that left Himmler feeling uncomfortable. In 1933 Himmler set up the first concentration camp in Dachau, and in the next few years, with Hitler’s encouragement, greatly extended the range of persons qualified for internment in the camps. In October 1939 Hitler appointed him Reichskommissar für die Festigung des Deutschen Volkstums and Himmler was given absolute control over the newly annexed Polish territories. Responsible for bringing people of German descent back from outside the Reich to within its newly expanded borders, Himmler set out to replace Poles and Jews by Volksdeutsche from the Baltic lands, various outlying parts of Poland, and elsewhere. Within a year over a million Poles and 300,000 Jews had been uprooted and driven eastwards. In carrying out his task as supreme overseer of the Final Solution, Himmler proved himself a fanatical disciple of Nazi racial theory with an unswerving dedication to its translation into stark reality. By the time of the invasion of the Soviet Union in June 1941, Himmler’s complete strangle-hold of the police and security services was evident. He controlled the Reich Main Security Office (RSHA), firstly via Heydrich and then subsequently Kaltenbrunner, the criminal police under Nebe, the Foreign Political Intelligence service under Schellenberg, and the Gestapo under Müller. Through the SS he ruled supreme over the concentration camps and the death camps in Poland, Belzec, Sobibor and Treblinka. Himmler instructed Odilo Globocnik, the SSPF Lublin, to construct these extermination camps in order to effect the destruction of the European Jewry (see the page on his visits to these Aktion Reinhard camps). Himmler also created the Waffen-SS, a powerful private army, whose strength he had expanded from three to thirty five divisions, making it a rival military force to the Wehrmacht. In August 1943 Himmler was appointed Minister of the Interior, giving him jurisdiction over the courts and the Civil Service. 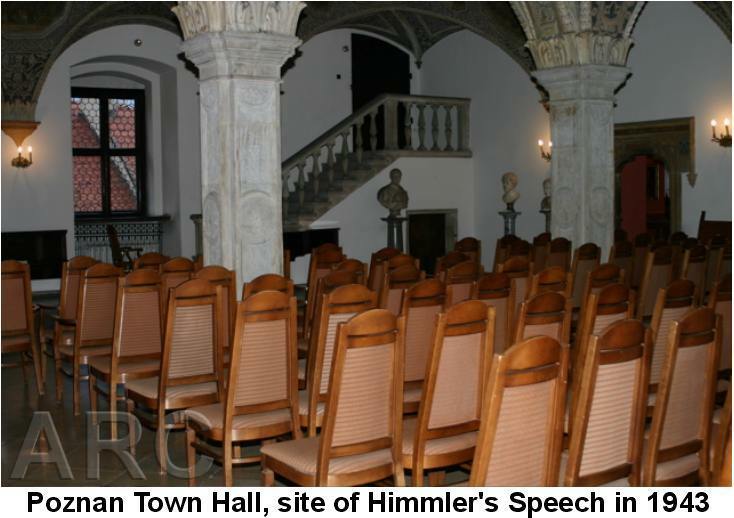 Himmler gave a notorious speech on 4 October 1943 to the SS Group Leaders in Poznan ("Posener Rede"), where he spoke about the extermination of the Jewish people in glowing terms, saying “This is a page of glory in our history which has never been written and shall never be written.” Following the plot against Hitler in July 1944, Himmler’s position was strengthened still further and the Wehrmacht was forced to accept him as Commander in Chief of the Reserve Army in addition to all his other activities. 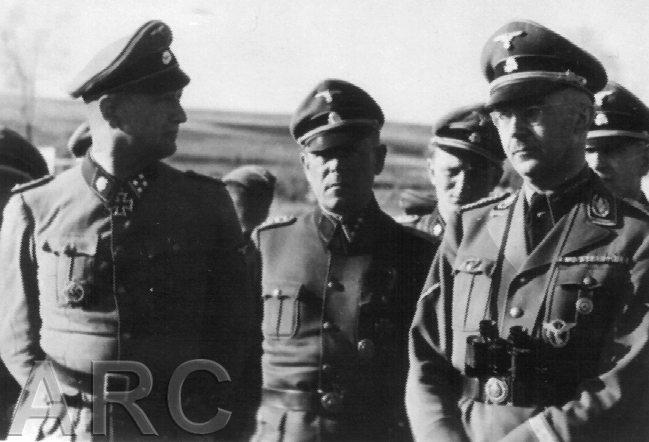 Himmler was granted supreme command of the Army Group Vistula, despite his lack of military experience. Realising the war was lost, Himmler attempted to approach the Allies for peace negotiations through the Head of the Swedish Red Cross, Count Folke Bernadotte. Himmler ordered the cessation of the mass slaughter of the Jews, and proposed the surrender of the German armies in the west, including Denmark and Norway, but the fight against the Russians would continue. Hitler, learning of the betrayal of his most trusted and loyal disciple was enraged, stripping Himmler of all of his offices. Following the German surrender Himmler took on a false identity and tried to escape, but was captured with a number of other SS men in (or near) Bremervörde (Lower Saxony). Himmler committed suicide on 23 May 1945. His body was buried in an unmarked grave near Lüneburg (See: Himmler's Last Days). See our Himmler Photo Story!